This Earthcache brings us to the natural monument of Dinosaur Footprints of Serra d'Aire, where you can see the tracks the world's oldest, to date found, footprints formed by sauropods. Há 175 milhões de anos, quando a Terra era um enorme continente em vias de ganhar novos oceanos, habitado por enormes animais, que designamos de Dinossauros, um grupo destes indivíduos de 4 patas, herbívoros, pesando +/- 40 toneladas, deixou-nos as suas pegadas durante um passeio à beira de um lago marinho. Com o passar do tempo, esse registo foi conservado debaixo de sucessivas camadas de sedimentos, que se transformaram em rocha calcária e deram origem à Serra d'Aire que hoje conhecemos. Actualmente, na Pedreira do Galinha, situada extremidade Este da Serra Aire, onde foram retiradas camadas e camadas de rocha da montanha, como em tantas outras pedreiras, devido à necessidade crescente da utilização da pedra para a construção civil, por mero acaso, foi descoberto em 1994, uma centena de pegadas de saurópodes, numa laje com 60.000m2, há muito desaparecidos. O estudo das pegadas fornece informações sobre a morfologia dos pés e das mãos dos animais, o modo de deslocação e a velocidade, etc. As pegadas também nos fornecem informação sobre o comportamento individual e social dos animais. Através estudos recentemente efectuados em animais actuais, podemos calcular através das pegadas deixadas por estes animais, tanto a velocidade do animal, como o peso, a largura e altura, etc.. Pensa-se que o modo de deslocação dos saurópodes seria bastante semelhante aos dos elefantes e devido a proximidade das pegadas, entende-se que caminhava com os membros debaixo do corpo. Passada: distância entre 2 pegadas deixadas pelo mesmo membro anterior, mão, no caso de animais quadruples. Esta fórmula foi posteriormente alterada, mais informação. Esta earthcache leva-nos ao Monumento Natural de Pegadas de Dinossauros da Serra d'Aire, onde podemos observar os trilhos mais antigos do mundo, até a data encontrados, de pegadas formadas por Saurópodes. Coordenadas são referentes ao parque de estacionamento do Monumento. Para logar esta cache terão que visitar o Monumento, custo 2€ para Crianças (até aos 12 anos) e 3€ para Adultos, aberto de terça a domingo, mais informações ver o Site do Monumento das Pegadas. 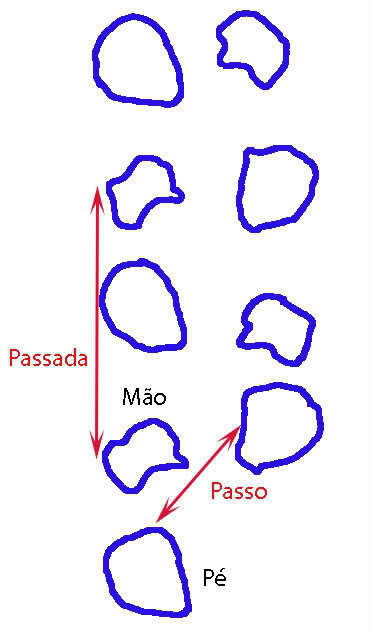 Nestas coordenadas: N39º 34.169 W008º 35.359 (FotoA) virados para sudeste, calcula aproximadamente o comprimento da Passada da mão esquerda, não é necessário ultrapassar a corda. O saurópode estaria a correr? Justifica a resposta. Coloca no log (depois de autorizado) uma foto com o gps no Jardim do Jurássico. Estudos neoicnológicos – encontrar os melhores análogos para testarmos a aplicação da fórmula de Alexander a dinossáurios terópodes extintos. 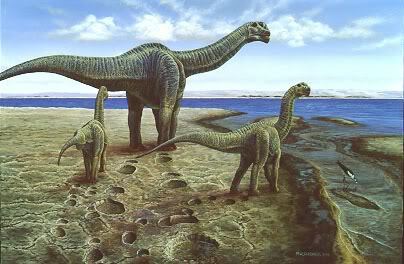 There are 175 million years ago, when Earth was a huge continent in the process of gaining new ocean, inhabited by large animals, which we call the dinosaurs, a group of individuals 4 feet, herbivores, weighing + / - 40 tons, let their footsteps during a stroll along a lake environment. Over time, this record has been preserved under successive layers of sediment, which turned into limestone and gave rise to the Serra d'Aire we know today. 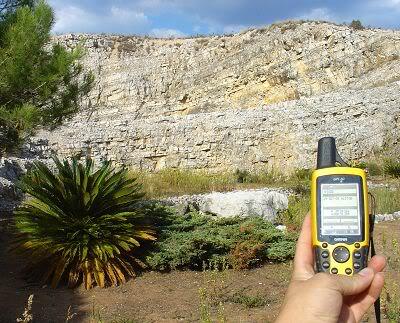 Currently , the quarry's Galinha, located East end of Mountain Aire, which were removed layers of rock of the mountain, as in many other quarries, due to the increased use of stone for building, coincidentally, was discovered in 1994, one hundred footprints of sauropods, a slab with 60.000m2, long gone. This remarkable tracksite of the Middle Jurassic period (approximately 175 million years old) contains not just the oldest and longest sauropod tracks known anywhere, but also exceptionally well preserved traces of some of the largest land animals that have ever lived. The sauropods were quadruped herbivorous dinosaurs with small heads and long necks and tails. Their sturdy bodies stood on thick, strong limbs (similar to elephants) with sharp claws on the thumbs and large toes. 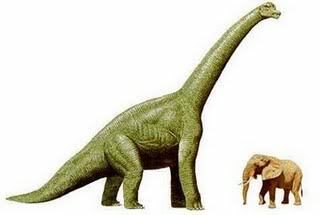 The rear limbs of the sauropods were usually larger than front limbs. 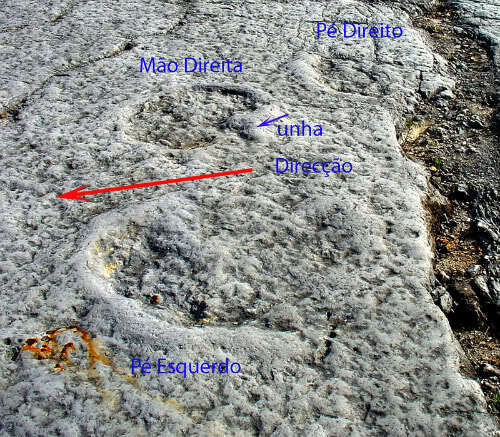 The tracks we can see at the Pedreira do Galinha site were originally made in carbonated mud, which was very fine and easily shaped, and deposited in shallow (1-2 meters) lagoon conditions. The sediments present in the visible strata of the tracksite, deposited over millions of years, were later transformed into limestone, which was quarried on the site until very recently. The study of footprints provides information on the morphology of the hands and feet of animals, the mode of travel and speed, etc.. The tracks also provide us with information about the individual and social behavior of animals. Through recent studies in animals today, we can calculate by the footprints left by these animals, both the speed of the animal, such as weight, width and height, etc. .. It is thought that the mode of movement of sauropods would be quite similar to those of elephants and because of the proximity of the tracks means that walked with members under the body. Week: 2 distance between footprints left by the same forelimb, hand, in the case of animals quadruples. This Earthcache brings us to the natural monument of Dinosaur Footprints of Serra d'Aire where you can see the tracks the world's oldest, to date found, footprints formed by sauropods. In these coordinates, N39º 34.169 W008º 35.359 facing east, estimates about the length of the Week of the left hand is not necessary to go beyond the rope. The sauropod would be running? Justifies the answer.